Australia maintained their commanding position on day two of the second Test of their three-match series against New Zealand in Perth. The hosts resumed on 416-2 and despite losing seven wickets while adding 143, they still declared on a massive 559-9. David Warner edged to second slip after adding only nine to his overnight 244. New Zealand soon lost openers Martin Guptill and Tom Latham but Kane Williamson (70 not out) and Ross Taylor helped them to 140-2 at the close. Taylor made an unbeaten 26 as the third-wicket pair shared an unbroken stand of 53, fending off the Australian attack with a stubborn rearguard action. That partnership is expected to be key if their side are to make significant inroads into a deficit which still stands at 419. 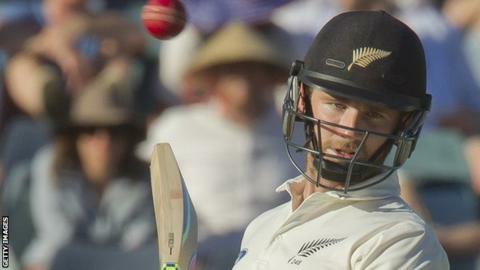 New Zealand are already 1-0 down in the series, having lost the opening Test in Brisbane. The declaration came not long after off-spinner Mark Craig (3-123) picked up the wickets of Peter Nevill, Mitchell Starc and Mitchell Johnson in the same over, all three falling with the score on 547. However, Starc then struck in the third over when he trapped Guptill lbw for one, while Latham (36) added 81 with Williamson before he was caught at slip. Khawaja, 28, scored 121 in Australia's first innings but re-injured his left hamstring while fielding on Saturday and will undergo a scan on Sunday. "My fingers are crossed that he can try and recover in the next 10 to 15 days," said Warner. "[Having scored] back-to-back hundreds, and running a lot out in the middle, and fielding at mid-off as well - having to chase a hell of a lot of balls to the boundary - is not ideal. "But that's part and parcel of this game. It can be quite challenging." Listen to ball-by-ball commentary of every day of the Test series on BBC Radio 5 live sports extra from 02:05 GMT.